I've published 10 science books for kids since 2012. Nine were "fact" books, dealing with straightforward, concrete information. 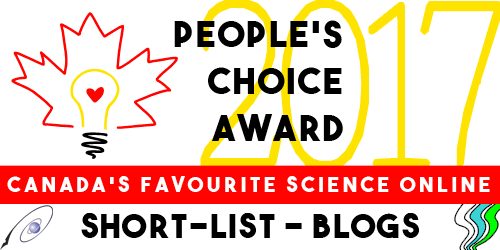 The tenth is on the scientific method - a way of thinking - and my experience on that project showed me how much harder it is to write effectively about something so insubstantial and abstract. Is there anything more abstract than time, the subject of Pascale Estellon's latest book? Starting with one second and working up to one century, Estellon's done a marvellous job of taking the insubstantial and making it concrete. She relates each measure of time to a specific activity young children have already experienced, giving them a solid frame of reference. One second, for example, is the amount of time it takes to turn the page of the book; one hour is how long it takes to mix and bake a pound cake. The recipe for the cake is included, encouraging kids to tackle time in an interactive, hands-on way. 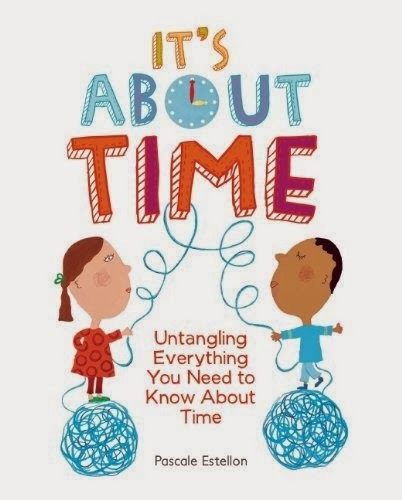 The book also includes questions, activities, and a clock kids can make and use while learning how to tell time. The design is extremely visual - Estellon's illustrations don't just add colour and life to the page, they are used to explain and help kids picture difficult concepts. The only concept in the book I felt wasn't clearly explained is the Monday's Child rhyme included in the days of the week section - the heading asks kids "What day of the week are you?" without explaining that the rhyme relates to birth day. 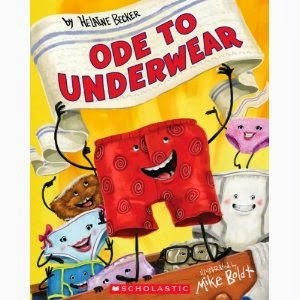 Unless kids are reading with an adult who's familiar with this rhyme and can explain, they may find this a bit confusing. Altogether, however, It's About Time is cheerful, appealing, and very effective, and I heartily recommend it. I blame my dad for nurturing my natural propensity to put names to things. He was a walking encyclopedia and knew the names of all kinds of things—of rocks and minerals, of trees and plants, of clouds and bugs—and could easily explain the differences between, say, the flat needles of a hemlock tree and those of a balsam fir (hemlock shorter; fir with two light stripes on the underside). He fell short, though, on the names of birds, and couldn’t differentiate between a Downy Woodpecker and a Hairy one. Understanding that this was a flaw, he bought the family a copy of Peterson’s A Field Guide to the Birds when I was ten. It was spring thaw when he took me to the Humber River to try it out. We shared the binoculars, but I was given the honour of being Keeper of the Book. Breakup had just happened and the river was swollen and roiling, carrying fast-moving ice floes towards Lake Ontario. 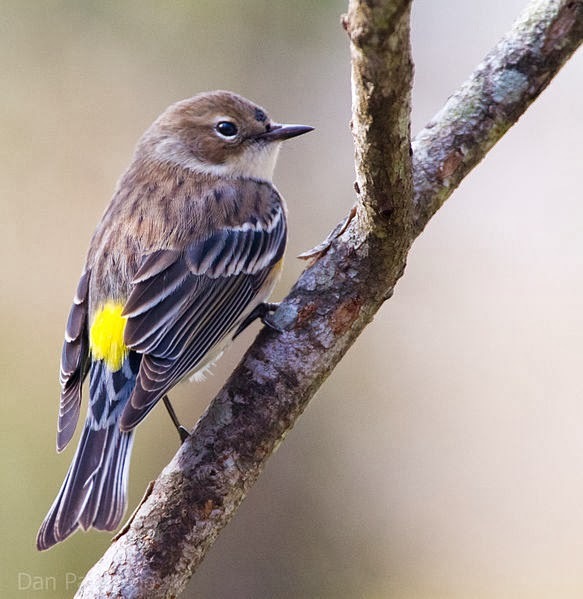 While trying to find a picture to match the tiny yellow-rumped bird I’d just seen, I did the unimaginable. I dropped the precious book. To my horror, it tumbled down the bank, straight into the freezing Humber. The river was moving fast. 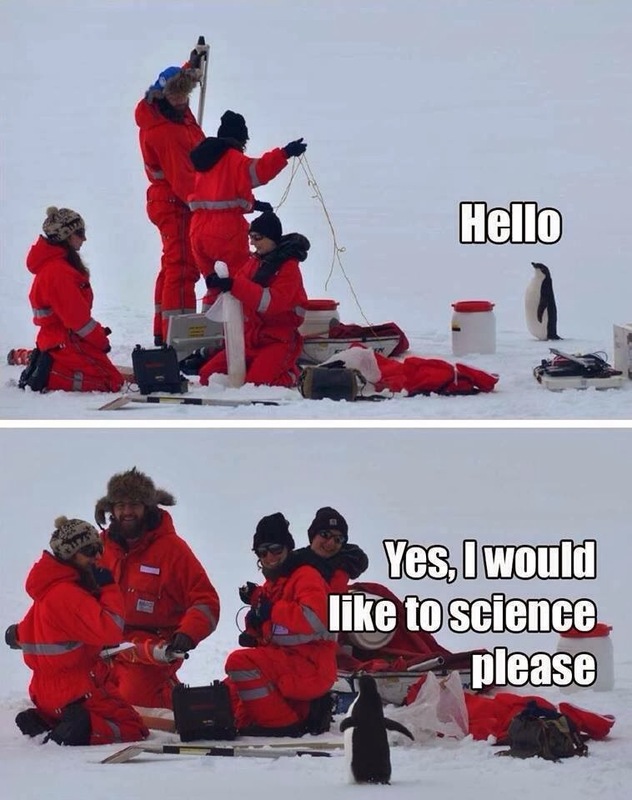 And so was the ice. And now, so was the book. In a family like mine, it was clear to me at a very young age that books were important. I just didn’t know how important until that day. My dad was no athlete. We didn’t play catch, and I never did see him run. But when that book hit the water and started to float away, he leapt into action. He skidded down the bank, and then—just like a super hero—he pounced onto the nearest ice floe. It tilted precariously, but he maintained his balance. Following the bobbing book, he leapt to the next floe. Then the next. He kept going until the prize was within reach. Somehow he scooped it sopping from the water without falling in himself, then inelegantly danced from one floe to another until he’d made it back to shore. My dad had just risked his life for a book. A book! Powerful moment. The book, of course, was ruined. But no matter. He bought another. Which I still have. of the pocket version is due out next month. Remarkably, that Peterson guide held its position as my birding bible for more than thirty years, and might have remained there if ornithologist David Allen Sibley hadn’t decided to spend ten years hunkered down with watercolours and brushes to paint the 6,600 images of 810 species found in the Sibley Guide to Birds, first published by Knopf in 2000. 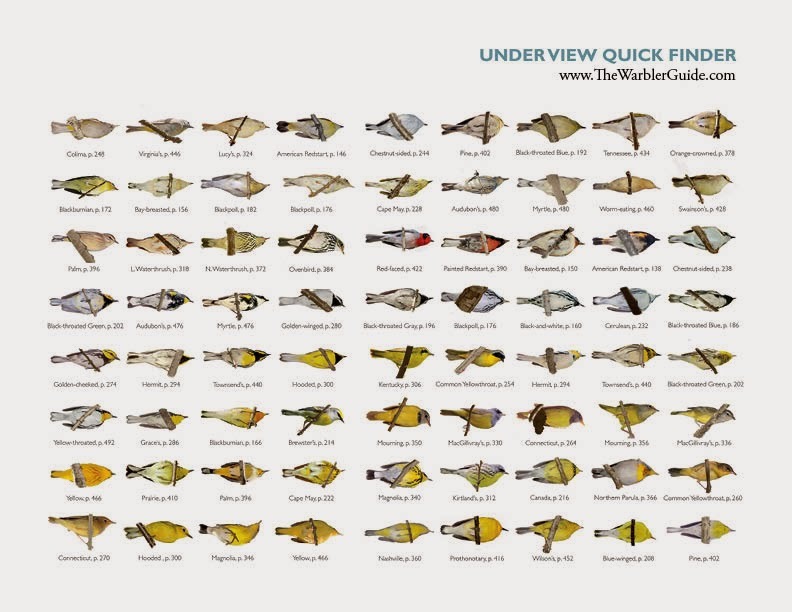 With multiple depictions showing alternate and juvenile plumages, flight patterns, and comparative perching views, it’s a monumental and irreplaceable work. Though the original edition is too cumbersome to be used comfortably in the field, pocket editions have been available for several years. So what’s a warbler hunter to do? Well, Sibley’s is good, but a new book, The Warbler Guide (Princeton University Press, 2013), completely blows it out of the water. In this unbelievably comprehensive book, Tom Stephenson and photographer Scott Whittle tease warblers apart with a fine tooth comb—not literally, of course, but with more than 1,000 photographs. Each species, (presented alphabetically by common name—yes! ), is extensively explored with multiple views, close-ups of distinctive characteristics, photographs of comparison species, visual tips on aging and sexing, detailed range maps, and numerous captions that cover behavioural traits. Each species is also given several pages of sonograms to help with identification by song or call. “Quick Finder” spreads show these little beauties from a variety of angles, fantastic resources that are downloadable for free from Princeton University Press. will go a long way in reducing "Warbler Neck." But what if you see a warbler and before you can identify it it flits out of sight, leaving only a falling feather in its wake? 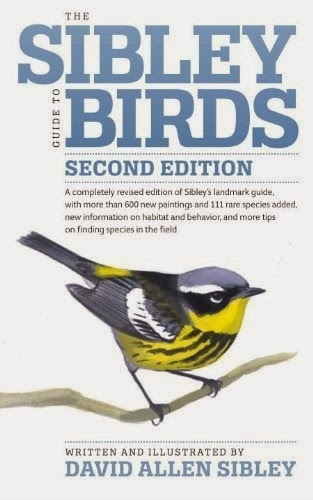 Another book comes to the rescue: S. David Scott and Casey McFarland’s Bird Feathers: A Guide to North American Species (Stackpole Books, 2010). 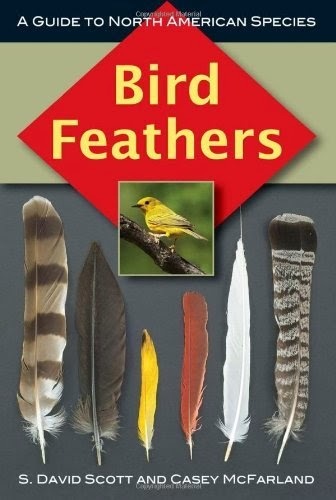 The first part of the book has detailed information about avian physiology, conservation, feather morphology, bird flight, tips on flight feather identification, and an explanation of feather colour and iridescence. 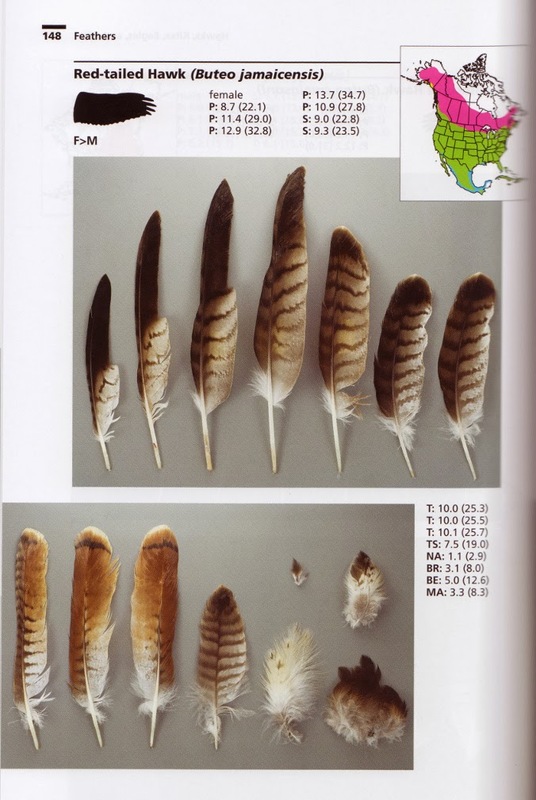 The bulk of the book, however, shows examples of each species’ right wing feathers, all clearly photographed on neutral backgrounds, along with measurements and range maps. Whether you find a stray feather lying at the side of the road, or the fluffy, strewn remains of a predator's kill, this book, like all the others in this post, is a wonderful resource. In the November 2013 issue of The Atlantic, the Editors present a list of their top 50 inventions since, well, the wheel. A few years ago, I covered this same ground in my book What's the Big Idea? from Owlkids. Needless to say, the choice presented in my book were not exactly the same as the ones the Atlantic came up with (and there are more of them). That's partly because I selected inventions based on what's most important to kids. For example, there's the all-important needle. The needle you say? Why would kids care about a needle? Without the needle, there'd be no underwear. And without underwear, we wouldn't have survived the freezy breezy.